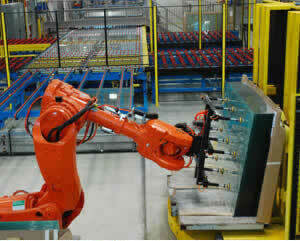 QComp Robotic Glass Racking Systems for end of the line production. QComp's glass racking systems utilize robotics to automatically take glass from a line or process and place to a rack, box or carton. 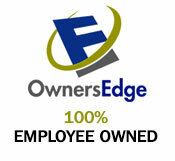 Capable of handling a large range of glass sizes. Multiple stacked and multiple layered racks are easily loaded. Two, dual-station rotary tables allow for staging of two full racks while two empty racks are staged for loading. Optional linear track for extended robot work envelope. Automatic tool changer for quick tool changing to handle multiple-sized lites. Sensors determine exact location and angle of rack before robot loads glass on rack. Seamless integration with line controls. Vision system for precise placement of lites on rack.